The business landscape for the fashion industry has changed a great deal in recent years. That’s thanks, in part, to the relentless advance of technology, particularly the rise of mobile devices and the Internet’s worldwide availability. Together, they have thoroughly disrupted the retail markets everywhere. In this context, branding that adds value becomes all the more essential to success. The discovery of new fabrics and manufacturing techniques also expands the business and creative promise of fashion design. But how exactly do fashion designers and brand owners reorganise to respond to endless change? And how can their designs and products continually appeal to new generations of consumers while being mindful of our planet and its sustainability? These are a few of the central issues facing the fashion industry today, and they are among the issues this forum seeks to address these two days. Allow me to suggest two aspects for your consideration: capitalising on our creativity, and maximising the value of cross-sector collaboration. In this, and much more, I am sure the forum’s illustrious line-up of speakers and participants will have much to say, and share. Alongside forum discussions, Fashion Asia will also present “10 Asian Designers to Watch”, an exhibition opening today and continuing through Sunday at the Qube, in Central’s PMQ. The 10 featured Asian designers will show capsule and pre-fall collections. A series of creative events will also take place, making it an unforgettable week of Asian fashion flair here in Hong Kong. When the Financial Secretary announced, in last year’s Budget Speech, that the Government would inject $500 million into the Hong Kong fashion industry, we knew that the momentum – that critical creativity and drive – must come from the industry itself. And in this regard, we have placed significant effort in tapping the pre-eminent minds of the fashion world over the past year and more. Fashion Asia extends that effort. Through this forum, it brings together extraordinary international talent, brimming over with ideas and insight. And I know we all look forward to their input and inspiration over these two days. Acting Financial Secretary Gregory So gave these remarks at the “Fashion Challenges” Forum of Fashion Asia 2016 Hong Kong on November 28. I think nothing is more enthralling than observing the formation of a new star. Imagine being able to watch the parade of 10 new stars at the same time! The “10 Asian Designers to Watch” Exhibition gives us just this blissful opportunity. Works of 10 rising Asian stars of exceptional talent and flair have been collated for this week-long showcase. This curated exhibition celebrates innovation, phenomenal design and remarkable craftsmanship, and tells stories through the exhibits. It celebrates the birth of new stars, and shares with us a piece of their minds, full of white hot burning energy. And by observing the new stars, we know more about the entire Asian fashion ecosystem, and how different elements of this ecosystem interact with each other. We are given a glimpse into the greater fashion galaxy, of which Hong Kong is a small but vital part. The Hong Kong Special Administrative Region Government attaches great importance to the diversified development of Hong Kong’s industries. Hong Kong’s fashion industry, with its roots deeply set in the territory’s experience in the textiles and clothing industry, propelled by emergence of new, young fashion design talents, is scaling new heights. We are stepping up promotion of Hong Kong fashion designers and brands, strengthening technical support and training for fashion designers, and will soon launch a dedicated incubation programme to groom fashion talents. In formulating support measures, we established and consulted the Advisory Group on Implementation of Fashion Initiatives, comprising mainly of members of the fashion industry. I am glad to see that, under the leadership of Victor, its efforts are beginning to bear fruit. The “10 Asian Designers to Watch” Exhibition is an important component of the larger event, “Fashion Asia 2016 Hong Kong”, a concurrent event of Business of Design Week 2016. Through synergising these events, we showcase the strength and potential of Asian design artists on the world fashion stage and its many manifestations outside in the galaxy of fashion design. Secretary for Commerce & Economic Development Gregory So gave these remarks at the “10 Asian Designers to Watch” Exhibition of Fashion Asia 2016 Hong Kong on November 27. The development of PolyU over the decades is a remarkable story of academic growth and success. The future is one that sees rising international recognition and standing. In the QS World University Rankings 2016, PolyU stands among the world’s top 50 in eight disciplines. It has also moved up to the 22nd place in Asia under the Times Higher Education University Rankings. These results not only testify to PolyU’s regional and international impact, but also exemplify the rapid advancement of higher education in Hong Kong. PolyU excels, firstly, as a builder of connections. Here we are talking about not only the ties with academics and alumni. PolyU’s bonds with employers and the community are what make it outstanding. As it pioneers an education model that combines professional knowledge with service-learning and real-world experience, PolyU works closely with employers of various fields and keeps its eyes open to the changing needs of the people to ensure that the University’s teaching and learning are always relevant and applicable to the real world. By no coincidence, connection is the key to Hong Kong’s success in the past, and more so in the future. I am sure you have heard of China’s Belt & Road initiative already. This national strategy aims to strengthen policy co-ordination, infrastructural connectivity, unimpeded trade, financial integration and people-to-people bonds amongst over 60 countries on three continents. It offers unlimited growth prospect. Hong Kong will play a significant role in this visionary blueprint as a super-connector. And beyond Asia, the global economic and cultural shift is also moving in our favour. It is all the more important for us to open our minds, build up networks and be a part of this promising future. Our universities will have a crucial role to play in all these endeavours. Universities are where new ideas emerge and develop, where different cultures interact, and where society’s future is shaped. For the connections that we need, PolyU is weaving an effective global network which further facilitates educational development and cultural exchanges. PolyU was one of the co-founders of the University Alliance of the Silk Road in 2015, and the Alliance now has connected 124 universities from 32 countries and regions. A range of activities have been organised to broaden students’ horizons and enrich their understanding about the Belt & Road countries. It is encouraging to see PolyU’s remarkable progress on this front. Hong Kong is also well placed to take bigger strides towards innovation and technology, which brings me to my second point – that PolyU is a pioneer. Research is an important element here. It informs teaching and advances the frontiers of knowledge and technology. It constitutes an engine driving Hong Kong towards a knowledge-based economy. There is general consensus about the need for stepping up mid-stream research in our universities and translating research results into application. That is why the Government has earmarked $2 billion for the Innovation & Technology Bureau to encourage institutions funded by the University Grants Committee to carry out mid-stream translational research. PolyU has a very good foundation in this regard. Charged with the vision to excel in applied research, it has pioneered numerous projects of the kind over the years. The Government plans to roll out a $500 million Innovation & Technology Fund for Better Living next year to finance projects that make use of innovative ideas and technologies to improve our daily living in areas of transport, education, environment, and healthcare. I believe PolyU can make the most from the initiative to further apply its strengths as a pioneer. First, PolyU’s proprietary optical fibre sensing technology in monitoring railway has been adopted in Hong Kong and in the Beijing-Shanghai High-Speed Rail. More recently, the technology has also been adopted overseas, in metro lines in Singapore. Second, to capitalise on the opportunities offered by the fast-growing global aviation industry and the Government’s plan to build the third runway at Chek Lap Kok, PolyU has partnered with Boeing to establish Hong Kong’s first Aviation Services Research Centre, and launched programmes in aviation engineering and management. Third, the camera pointing system that PolyU jointly developed with the China Academy of Space Technology landed on the moon in 2013. It was the first Hong Kong-made instrument deployed in the Chinese lunar exploration programme. Lastly, the home-grown electric vehicle “mycar” that PolyU jointly developed with EuAuto Technology Limited was launched in 2009. It was the first Hong Kong-developed vehicle which fully complied with European standards. Chief Secretary Carrie Lam gave these remarks at the Hong Kong Polytechnic University 80th Anniversary Launch Ceremony on November 25. Six months ago, I celebrated with you the 15th anniversary of the Hong Kong Science & Technology Parks Corporation here. And over these 15 years, the Science Park has helped entrepreneurs turn possibilities into realities, dreams into success. In the process it has helped Hong Kong advance. The Science Park, meanwhile, has also grown and evolved – the completion of its Phase 3 development earlier this year was a significant milestone. From a piece of reclaimed land at the Tolo Harbour waterfront, the Science Park has become home to over 620 local, Mainland and foreign technology companies. Now more than 11,000 people work here. And I applaud Mr Tung Chee Hwa, the first Chief Executive of the Hong Kong Special Administrative Region, who led us on this journey some 20 years ago, for his vision. Today, the Science Park is our most important innovation and technology focus. Physical space and laboratory equipment apart, the Park offers one of the largest and most successful technology incubation programmes in the city. It also helps partner companies grow their businesses. And the Science Park is actively promoting three overarching, cross-disciplinary platforms, namely healthy ageing, robotics and smart city. These platforms provide a focus and are designed to facilitate integration of technology in innovative products, to help I&T companies thrive. The Science Park’s work supports the Government’s “re-industrialisation” vision and mission. To maintain our competitiveness in the 21st century, Hong Kong must move towards a high-tech economy. We must develop high-value added industries, so as to diversify the economic base and provide better jobs, and better choice of jobs with higher incomes to the Hong Kong people, in particular our young people. By “re-industrialisation”, I mean picking the winners – the industries and sectors that Hong Kong has a leading edge in, the ones that fit well into our economic and physical environments. Healthy ageing, robotics and smart city are three such areas, alongside biotechnology, big data and others. A year ago – it was actually a year and two days ago – the Government established a dedicated bureau, the Innovation & Technology Bureau, to formulate policies and drive I&T developments in Hong Kong. I am pleased to note that, at the bureau’s first anniversary, our efforts have gained good traction. An I&T awakening is obvious. The media has become more interested in I&T stories. Advocacy and messaging through the media are abundant. Incubators, co-work spaces and tech hubs are springing up. And there is much stronger engagement between the Government, the industry, the academia and the research sector. In this year’s Policy Address and Budget, the Government has committed over $18 billion to boost I&T development – a $2 billion Innovation & Technology Venture Fund to encourage investment in I&T enterprises, and a $2 billion injection into the Innovation & Technology Fund to encourage midstream research in universities, as well as commercialisation of R&D outcomes. Another $500 million was invested into the Innovation & Technology Fund for Better Living – to promote I&T applications that make our daily life more convenient, more comfortable and safer. We are, of course, investing a great deal in the hardware of our I&T bases. These include the major infrastructural projects at the Tseung Kwun O Industrial Estate and the Science Park. Within six months of its establishment, the Innovation & Technology Bureau secured $4.4 billion from the Legislative Council for the Science Park expansion project. By 2020, we will be seeing two tower blocks with an additional office space of over 70,000 square metres, increasing the total floor space of Science Park to some 400,000 square metres. The park’s annual economic contribution to Hong Kong will increase from $10.8 billion today to $19 billion when full occupancy is reached for the expanded Science Park. Looking ahead, the Government will continue to work hand in hand with the Hong Kong Science & Technology Parks Corporation to drive I&T and promote “re-industrialisation”. The corporation will develop an Advanced Manufacturing Centre, and a Data Technology Hub in the industrial estate to promote smart production and high-end manufacturing. This huge development project is estimated to cost about $8.2 billion. The Government will also identify suitable sites near the Liantang/Heung Yuen Wai Boundary Control Point to meet the long-term needs of I&T industries in Hong Kong. Last month, I had the pleasure of officiating at the inauguration of the Ming Wai Lau Centre for Reparative Medicine, here in the Science Park. The centre is a result of collaboration between Hong Kong and Karolinska Institutet, a prestigious medical university that selects Nobel laureates in physiology or medicine, and world leader in key biomedical research fields. The centre is Karolinska’s first centre outside Sweden in its history of more than 200 years. At the ceremony, I pointed out how world-class institutions such as Karolinska and Massachusetts Institute of Technology make use of Hong Kong as a base for “super-connecting” to the Pearl River Delta Region and the whole of the Mainland of China. Indeed, our combined advantages under “one country, two systems”, close connection to the industrial bases in the Mainland, together with a deep talent pool, robust intellectual property regime, sound legal system and first-rate technology infrastructure, promise great prospects for Hong Kong’s I&T industries. I encourage the community, especially our young people, to reach out for Hong Kong’s I&T future. We are in the right place, and at the right time, for I&T are being supported not only in Hong Kong, but also on the country level. In the National 13th Five-Year Plan, the country supports Hong Kong in developing I&T industries, and encourages our young people to start businesses in the Mainland. Hong Kong is not alone in the pursuit of technology. And innovation and technology are not just about profits. They are also about life, the quality of life, of every man, woman and child in all walks of life. In the declaration issued yesterday at the end of the 2016 APEC meeting, the leaders of the 21 economies declared, among other things, that “ICT plays a vitally important role in human development”. Chief Executive CY Leung gave these remarks at the Hong Kong Science Park Expansion Programme Ground Breaking Ceremony on November 22. Some 60 years ago, goods were shipped as they had been for centuries: as loose cargo in wooden crates packed, stacked and crammed into a ship. The process was unwieldy, inefficient and unreliable. Theft was rampant. The loading and unloading of cargo took ages and a whole lot of dockhands. And then, things changed, thanks to the invention of uniform metal containers in 1950s. The cost of the very first container ship was 16 US pennies per tonne to load, compared with nearly six US dollars per tonne for loose cargo. And more could be loaded: in 1960s, dock labour moved only 1.7 tonnes an hour onto a cargo ship. In early 1970s, they were loading 30 tonnes an hour. This, together with increased productivity, meant lower costs to move goods. Today, we are well into the age of container transport – by ship, rail or truck – without the need for re-packing when changing the transport mode. This means that goods can be traded quicker, cheaper and more efficiently. The revolution of container transport is a classic example of how innovative ways of logistics can boost trade, encourage commerce, and drive economic development. In Hong Kong, logistics and maritime services have long been one of the pillar industries of our economy. Since the 1970s, we have steadily established ourselves as a regional logistics hub and international maritime centre. Trading and logistics together make up the largest sector of the Hong Kong economy. Last year, trading and logistics contributed 23% of our overall Gross Domestic Product and 20% of our employment. Strategically located at the heart of Asia, Hong Kong has long been the gateway to southern China, and the bridge between the Mainland and the rest of the world. Our infrastructure is world-class, rated first in the World Economic Forum’s Global Competitiveness Report. Our robust economy, trade freedom, regulatory efficiency, and excellent logistics services have made Hong Kong one of the world’s busiest logistics hubs. The Hong Kong Port is one of the most efficient ports in the world, with an annual throughput of more than 20 million TEUs (Twenty-foot Equivalent Units). About 340 container vessel sailings a week leave Hong Kong to some 470 destinations worldwide. Last year, we received over 100,000 cargo vessels. And we are keen to maintain our competitiveness in the logistics and maritime sectors – by promoting high value-added maritime services. Here in our city, over 700 companies are already offering a variety of maritime services – from ship management, ship broking and chartering, registration, finance, maritime insurance, to maritime law and arbitration. Maritime insurance, in particular, is a case in point. We have the largest cluster of representatives from the International Group of Protection & Indemnity outside London, with 12 of its 13 members offering services in Hong Kong. We recognise the challenge of competition and will not rest on our laurels. In April this year, the HKSAR Government sets up the Hong Kong Maritime & Port Board, which is tasked to formulate strategies to promote the development of high value-added maritime services on all fronts, including manpower development, marketing and promotion, as well as industry development. Last month, the International Union of Marine Insurance has announced the establishment of its Asian hub in Hong Kong. This is the Union’s first offshoot outside its headquarters in Germany. I welcome many more international partners to Hong Kong, to make good use of Hong Kong’s growing maritime services sector. Shipping aside, Hong Kong is connected to cities around the world by airplanes. From here, we can reach all of Asia’s major markets within four hours’ flight time. Half the world’s population is within five hours of reach from Hong Kong. The Hong Kong International Airport hosts more than 100 airlines, operating some 1,100 flights each day to 190 international destinations. Our airport has been the world’s busiest international cargo airport for the past six years, handling over 4.38 million tonnes of cargo a year. And we are building an even better aviation hub, moving ahead with a three-runway system. The project includes reclamation of some 650 hectares of land, construction of a third runway, a new concourse, new automated people-moving and baggage-handling systems. When completed, our airport will have the capacity to handle about 100 million passengers and nine million tonnes of cargo a year. On land transport, we are well into completing our section of the Hong Kong-Zhuhai-Macau Bridge. On completion of this mega-project, a journey from the Hong Kong International Airport to Zhuhai will drop from four hours to about 45 minutes, expanding our cargo capability in the Pearl River Delta’s western reaches. Given our superb connectivity in sea, air and land, Hong Kong is well-placed to participate in China’s Belt & Road Initiative – a topic that will be explored during the Plenary Session. Let me just say briefly that, amongst the 60 or so countries along the Belt & Road, the Hong Kong port has marine cargo movements with 45 of them. We have signed air services agreement or international air transit agreements with 40 of them. This certainly gives Hong Kong a clear edge in meeting the increasing need for logistics services in the Belt & Road regions, particularly in emerging economies where high quality logistics services are in high demand. Malcom McLean’s first ship carried 58 containers back in 1956. Today, mega-vessels carry more than 19,000 containers. I would say our ship has come in, and it will keep coming in. Acting Chief Executive Carrie Lam gave these remarks at the Asian Logistics & Maritime Conference on November 22. It gives me great pleasure to welcome Prof Robert Zimmer, President of the University of Chicago, to Hong Kong and to join him at the Naming Ceremony of the University of Chicago Center in Hong Kong. It is indeed a happy coincidence that Chicago is our partner city in the Business of Design Week (BODW) 2016 commencing later this month. Featuring the theme of “Chicago Made”, this year’s BODW embodies the innovation spirit and creative endeavours for reshaping the future. I have no doubt that the University of Chicago Center in Hong Kong will also play that futuristic role. This Hong Kong Center will house the Asian campus for the Executive Master of Business Administration, EMBA, programme of the University of Chicago Booth School of Business (Chicago Booth). Chicago Booth is a top-notch business school that has won global acclaim. I met with Dean Sunil Kumar of the Chicago Booth on two occasions in 2013 and 2014 about the plans to relocate Chicago Booth’s Asian campus to Hong Kong, with a view to further enhancing the school’s regional and global presence. It is naturally, in my view, a very wise move and something my government warmly welcomes. Despite Chicago Booth’s fame and our enthusiasm to receive its Asian campus, the allocation of the ex-Victoria Road Detention Centre site, or what we now call the Mount Davis site, to Chicago Booth under the Government’s Land Grant Scheme to support the development of self-financing post-secondary programmes was done in an open, fair and competitive process, the hallmark of Hong Kong’s way of conducting business. I wish to congratulate the Chicago team involved in a job well done. I am pleased the University of Chicago has enhanced the value of this project by turning it into a University of Chicago Center offering not only the EMBA programme but also a venue to bring together faculty, researchers and students from Chicago to work with those in Hong Kong, the Mainland and beyond on a wide range of issues. Hong Kong is the world’s most competitive and freest economy. Located at the strategic heart of Asia, our city can access all of Asia’s key markets within four hours and half the world’s population within five hours. As the gateway to the immense business opportunities in China, we are also gearing up to capitalise on our country’s Belt & Road Initiative, an ambitious scheme designed to strengthen economic, political and cultural links amongst over 60 economies spanning three continents. Apart from business, people-to-people link also forms an integral part of the Belt & Road. To home Chicago Booth in Hong Kong will deepen the university’s engagement in countries in Asia and along the Belt & Road corridor. The Hong Kong Special Administrative Region (HKSAR) Government has always put education at the top of the agenda. Indeed, education is the biggest spender in our budget, accounting for over 21% of the Government’s recurrent expenditure. We aspire to further develop Hong Kong into a regional education hub with world-class universities and quality institutions through diversification and internationalisation. We welcome non-local students to study, to do research and to take part in exchange activities here. It is our vision to nurture graduates with a broad knowledge base, global outlook, rich learning experience, skills to think critically and creatively, the ability to work independently and collaboratively, and most important of all, the integrity and devotion to serve the community they come from. Chicago Booth is the second oldest school in the US and one of the most highly regarded business schools in the world of professionals and leaders. Its decision to choose Hong Kong as the base of its flagship EMBA programme and other short-term programmes, which share the same faculty with those in Chicago and London, marks a significant milestone in Hong Kong emerging as an international education hub. As the Secretary for Development in the last term of the HKSAR Government responsible for Hong Kong’s heritage conservation work, the University of Chicago’s Hong Kong centre is a very special project to me. The ex-Victoria Road Detention Centre is a Grade 3 historic building with strong heritage significance which makes it a challenging site for redevelopment and revitalisation. I saw the artist’s impression of the design which was done by the late Bing Thom, the same architect who designed the Xiqu Centre in our West Kowloon Cultural District. I have every confidence that the building will be a much valued piece of architecture in Hong Kong and a Heritage Interpretation Center on the campus to showcase the history of the site, with free guided tours for the public, will no doubt enrich Hong Kong’s heritage asset. Thus, for the future University of Chicago Center we can envision not only a state-of-the-art institution offering a superb learning environment to students, but also a unique landmark reflecting Hong Kong’s architectural traditions and heritage. Chief Secretary Carrie Lam made these remarks at the University of Chicago Center in Hong Kong Naming Ceremony on November 21. Led and funded by the Hong Kong Jockey Club Charities Trust, CoolThink puts computational thinking and coding under the spotlight, a really bright spotlight. The Education University and City University from Hong Kong, together with MIT, from Cambridge, Massachusetts, are all united in the goal of inspiring students here in Hong Kong, bringing digital creativity into their lives and, in so doing, priming them – and priming Hong Kong – for tomorrow’s global economy. We have been able to secure MIT’s involvement, thanks to the Jockey Club, which reached out to Prof Hal Abelson of the MIT Computer Science & Engineering Department. He is the global leader in educational technology, and in making hardware and software speak to students in a language that they are familiar with. He was instrumental in the development of App Inventor, which transforms the arcane language of text-based coding into visual, drag-and-drop building blocks. That gives beginners the ability to create programmes and apps that work in about the same time it takes us to post an update on Facebook. The good news is that the Jockey Club’s CoolThink programme will use App Inventor to help students discover the magic of coding. I wish I had such a cool helper when I was using Fortran and Basic to write programs to facilitate my work back in those “prehistoric” days. But that was then. Today, technology has gone beyond our wildest dream and has become integrated with everything that we do. And technology is becoming increasingly pervasive and central to our work, to our lives, and to our future. And, whether we know it or not, it is all powered by coding. Now, thanks to this seminal, four-year initiative, 32 Hong Kong schools, counting some 16,500 upper primary students, will learn to move well beyond the basic consumption of technology. They will embrace it as a smart tool to solve problems, to create and to innovate. Our Education Bureau will ensure the curriculum and supporting teaching materials created by MIT and our Education University will respond to the specific needs of the schools, and students, involved. And CityU will be recruiting and training university students to serve as teaching assistants – and to organise events that help parents understand the power of coding as well. In many respects, CoolThink reflects a much larger strategy. I am referring to the far-reaching agenda of our government in making Hong Kong an innovation and technology leader in the global economy. Innovative technology in the hands, in the minds and hearts of a creative workforce will surely propel our future, will help Hong Kong diversify its economy and will enhance the competiveness of our industries and businesses. It will expand employment opportunities and, no less important, it will improve the quality of our lives. In moving towards that goal, I have allocated $18 billion in my 2016-17 Budget to support the development and application of innovative technology. But money alone, of course, cannot guarantee innovation. That is why we have been busy connecting local stakeholders, while attracting international talent and prestigious institutions to come to Hong Kong. On that score, we have been doing a pretty good job. A dozen overseas institutions, innovation labs, incubators, accelerator programmes, and so forth, have already found their way to Hong Kong, making excellent use of our R&D prowess and our unique business advantages. Financial Secretary John Tsang made these remarks at the Jockey Club Charities Trust’s CoolThink@JC launching ceremony on November 15. The free market principle has always been the fundamental ingredient of Hong Kong’s continued prosperity, the cornerstone of our sustained achievement, and the bedrock of our own brand of economic achievement as an international commercial, trade and financial centre. I have spoken on different occasions in the past on how the different components of the free market principle have contributed to our success as the poster boy for those values that we so cherish. I think we are all familiar already with all these points, and I shall not repeat them tonight. But I would, however, if you would humour me, brag a bit, as I have done previously, about our credentials and stunning track record of Hong Kong. With the greatest humility, I must honestly say that our track record has been pretty good. The annual Economic Freedom of the World report published by the Cato Institute and the Vancouver-based Fraser Institute in mid-September this year has once again placed Hong Kong at the top. We have done that every single year since the report first came out back in 1996. And earlier this year, the Washington-based Heritage Foundation has also named Hong Kong once again the world’s freest economy in their annual Index of Economic Freedom guide. They have done that for the past 22 years in a row. And among other accolades accorded Hong Kong by prestigious international institutions, I am particularly pleased that we regained in June this year the title of the most competitive economy in the world, according to the 2016 World Competitiveness Yearbook released by the International Institute for Management Development. Upon receipt of these welcome acclaims, we don’t show any extraordinary emotion or excitement, like running victory laps or tapping out exotic dance steps. We would issue the usual press statement, one that is plain, straightforward, informative and totally bureaucratic. Nothing more, nothing less. Perhaps our upbringing in a society that teaches us to be humble and subtle has a great deal to do with this behaviour, but we do take great pride in these honours, and we are grateful to these esteemed organisations for recognising our underlying strengths and giving us a thumbs up for our stubborn insistence. These are all nice and pleasant, but more importantly, these reaffirmations have enabled us to stay the course in plotting our programmes for the future, and in continuing to employ the values of free trade and the free market in shaping the economic policy of Hong Kong. That cannot be said for our world today. Indeed, in the past few years, free-market values have been taking the blame for many wrongs in the world, and these values have been put under immense pressure, particularly in the advanced developed economies of the West. Protectionist noises, on the other hand, have been getting louder, spreading dissonance and sowing discord in many parts of the world. Britain’s referendum in June in favour of Brexit, as well as the result of the US presidential election that came through last week were perhaps the clearest indications that sentiments against the open market and free trade are fast rising, fiercely refuting the achievements of many decades of increasing globalisation. Picking up on this gathering storm, the Economist recently argued that the new divide among rich countries is no longer between left and right, or liberal and conservative, but between open and closed. In an editorial asking rhetorically who would uphold the torch of openness in the West, the paper lamented the world’s “depressing company of wall-builders, door-slammers and drawbridge-raisers”. It wasn’t so long ago that globalisation was that unstoppable force that was quickly reshaping the world. And all of us here this evening know well that the liberalisation of trade, investment and immigration policies, together with the freer flow of goods, capital and people, have served to raise production efficiency, creating an increasingly connected global market that optimises on each economy’s unique strengths. As for the benefits of globalisation, well, they seem pretty clear to me. Advanced economies get to enjoy lower costs of consumption and greater access to new export markets, while developing economies get to enjoy quality growth and employment, and at the same time, they are able to integrate quickly into the world trading system and join the ranks of the global middle class. Over the past 20 years, global trade in goods and services has tripled in volume. China has been a major beneficiary. The Mainland of China’s per capita GDP increased 13 times over those two decades. Its rural population, generally poor in nature, fell by more than a stunning 100 million between 2010 and 2015. And that telling progress has also been visible in other emerging economies, such as India, Indonesia and Vietnam. No doubt, globalisation has helped bring millions of people out of extreme poverty, and helped improve the quality of life of many more around the world. And I believe that no other single movement or market trend in modern history carries the same powerful effect and successful impact as globalisation. Despite these achievements, today’s persistently weak global economy continues to batter free trade, eroding its primacy and its international reputation. Globalisation drives efficiency gains by inducing companies and individuals to specialise according to their relative strengths and comparative advantages. Those better equipped with knowledge and skills benefit more in this new economy, while those who are less mobile, less adaptive to global competition, can face painful dislocation. And this is evident from the fact that the unemployment rate has been higher for lower-skilled labour across many advanced economies. Increasingly, and perhaps understandably, people and economies are turning to isolationism and protectionism as the political rallying call to revive economic growth and create jobs resonates into a crescendo. Protectionism, unfortunately, would only dampen growth, wiping out the gains earned through more efficient allocation of resources among economies. Protectionist measures, in the form of trade barriers and tariffs on specific goods, also increase the costs of imports, thereby raising the cost of living for everyone. Globalisation, to be sure, is not omnipotent. While it propels economic growth, it brings with it distributional problems. The key question, however, is not about open or close economies. Rather, it is about whether governments can pursue policies that promote more inclusive growth, sharing the fruits of globalisation among economies, as well as across different segments within individual economies. Hong Kong vividly exemplifies the widespread rewards that can be realised in our open embrace of globalisation. With very little in the way of natural resources, Hong Kong has long relied on our extensive global business ties in driving our economy forward. Our trade is more than four times our GDP, making us the world’s most open economy and the eighth-largest trading entity. Without free trade, it is highly unlikely that we would have emerged as an advanced economy and an international financial centre. That said, we are fully aware of the need to help those in our community who lack the necessary skills and resources to cash in on the benefits of globalisation. That means, among other things, improving the competitiveness of our workforce to better adapt to the new global economy and its ever-changing needs. And I believe education is the most powerful tool that can help us achieve that noble goal. Education is the engine for transforming society and in driving the economy forward. Education instils knowledge in individuals, and knowledge, in turn, becomes the source of creativity, the spark for inspiration, the fuel for innovation. The collective ingenuity of individuals is the source of power that helps create a better world for everyone. More importantly, I believe education is the equaliser that accords everyone, rich or poor, the same opportunity to excel, that optimises everyone’s potential, and that gives members of the younger generation a fair chance to succeed. Through education, we are seeking to create a fair and level playing field for everyone in our community. This is the reason why we are doing our utmost to provide the best possible education to our future generations, from primary schools to tertiary research institutes, in order to ensure that we have an abundant supply of competitive and knowledgeable talents that can drive us forward, that can help us maintain our edge as a major international metropolitan city and a competitive economy in this era of globalisation. Indeed, education has been the single largest recurrent spending area in my annual Budget. Our education expenditure this year, by the way, is some 70% higher than it was a decade ago, while the student population, you may not be aware of this, in primary and secondary schools for the corresponding period has dropped 20 to 30 %. We are making a difference. The proportion of Hong Kong’s workforce with tertiary education has increased from 29% in 2005 to 38% last year. That is a big leap in terms of quality of our people, and in terms of our ability to cope with a fast changing world. In order for the new generations of young people to better themselves and their families, and to further improve the conditions of our society, we need to work relentlessly in safeguarding and maintaining Hong Kong’s many long-standing strengths, from our open and globalised market environment, our rule of law and independent judiciary, our transparent regulatory regime and our level-playing field for all to our community-wide distaste against corruption. These institutional strengths also give our businesses the resilience, and give our businesses the confidence, to tackle the global economy’s many ups and downs. While we are working hard to maintain a free market where every business, every individual, can realise their fullest potential, governments also have an important facilitator role to open up new markets, remove market impediments and enhance trade and investment. Ladies and gentlemen, globalisation creates endless opportunities for economies, for companies, for communities, and for individuals. It propels growth and development, improves the livelihood of millions and reduces poverty. No economy, large or small, should raise its drawbridge or slam its door. By reaping the benefits of globalisation, Hong Kong has managed to refrain from protectionism, and remain true to free-market principles. This has been our formula for success, and we must not be tempted to change course. I certainly would not attempt to change a formula that has worked so well because if I were to do so, I do not think that I would be invited to this free dinner again. So until the next time, if there is a next time, thank you very much and have a great evening. Financial Secretary John Tsang made these remarks at the Lion Rock Institute Freedom Dinner on November 14. This is, I am pleased to note, the eighth time that Hong Kong has hosted this prestigious international event since its inception in 1962. This year is particularly special, given that Lions Clubs International District 303 – Hong Kong & Macao, China is celebrating its 60th anniversary. I am sure you will enjoy this year’s delightful programme – a great opportunity to exchange knowledge and build friendship through seminars, exhibitions, bazaars and receptions. The theme of this year’s Forum – “Celebrate the Change” – puts a deserving spotlight on the work of District 303, and that of over 80 clubs in the region. I am particularly taken with this line from the theme’s statement, and I quote, “If nothing ever changed, nature would have no butterfly.” We humans are creators. We have the power to do good. To change lives. And we have the courage to face challenges. To fight for the betterment of humanity. That, I believe, is the commitment of all Lions, worldwide. And certainly those from District 303. Let me just say how grateful I am for their continuing efforts, their selfless services, over these past six decades. District 303’s projects are wide-ranging – from education and youth development to healthcare, elderly services and environmental protection – all very well-thought out initiatives to better the lives of the people. Not only in Hong Kong and Macau, but also in the Mainland of China and the rest of the region. The Hong Kong Government shares your spirit. Like Lions everywhere, we are determined to bring about change – better change – through developing the economy, improving the livelihood of the people, and creating a more equitable society by sharing the fruits of prosperity with all. 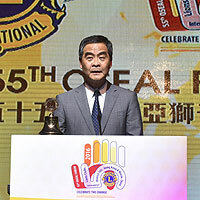 Chief Executive CY Leung gave these remarks at the 55th Orient & Southeast Asian Lions Forum on November 11. Affordability is an issue we have to address in the wider context of Hong Kong’s fiscal reality and demographics reality, namely a rapidly ageing population. It should also be seen against the commitments we have made since the beginning of this term of the HKSAR Government. When we assumed office in July 2012, one of our immediate priorities was to tackle elderly poverty. We took decisive action to introduce in April 2013 the means-tested Old Age Living Allowance (OALA) to enhance financial assistance for the needy elderly. Despite being a publicly funded social security scheme, OALA is designed to be simple and generous in terms of eligibility and to avoid stigmatisation in order to encourage the elderly in need to come forth to apply. At present, about 40% of elderly aged 65 and over are benefiting from this scheme. According to our poverty situation analyses, OALA is the most effective policy intervention in lowering the elderly poverty rate. The 2015 figures show that OALA has reduced the elderly poverty rate by 7.6% points, lifting 78,000 elderly out of poverty. With the introduction of OALA and other in-kind support like medical and residential nursing care, community and home care, transport subsidy, medical vouchers, etc, the annual elderly budget has risen from $42.1 billion in 2012-13 to $65.8 billion in 2016-17. The growth of 56% in recurrent elderly expenditure in the past four years is impressive, and so far affordable. But going forward, the heavy strain on our public finances cannot be ignored, when the number and proportion of elderly in Hong Kong will surge and the room for collecting more taxes is limited, if Hong Kong were to maintain her economic competitiveness. Sustainability is a question that no responsible government could ignore. Indeed, our retirement protection discussion in the past year was preluded by a long-term fiscal study commissioned by my colleague, the Financial Secretary. Released in early 2014, that study projected that even without any service enhancement, a structural deficit will occur in 2029-30 given the ageing of our population, and by 2041-42, our fiscal reserve will be completely depleted. By then, increase in taxes would be inevitable. If we were to introduce a universal pension scheme at some $3,000 a month for all elderly irrespective of their means, as fiercely demanded by some quarters, the dire fiscal situation would be aggravated. This brings me to the third challenge of equity. When public resources are limited and when we should not pass on the fiscal burden to the future generations, one could not help but ask whether providing each elderly person a standard monthly pension regardless of their assets and income is more just and fair than targeting public resources towards those more in need. Advocates for universal pension saw across-the-board protection as a basic right and a proper recognition of the elderly’s contribution to society. What they have not realised is such right and recognition would be at the expense of providing more help to the vulnerable old people and narrowing the gap between the rich and the poor. As we have emphasised in the public consultation document released last December, retirement protection encompasses not just financial assistance, but an array of housing, medical and nursing care services which the Government has to continue to provide through heavy subsidies. The current comprehensive protection is much treasured by our elderly, albeit with obvious room for improvement, for example in reducing waiting times. In my current capacity as the Chief Secretary, I chair an internal meeting called Star Chamber to decide on the allocation of new resources every year. I can tell you that this is a painful process when demand invariably outstrips supply. Confronted by these challenges, policymakers have to adhere to guiding principles in finding solutions. In this case, our multi-pillar retirement protection system is built upon the key principle that caring for the elderly is a responsibility to be shared by individuals, families and the community. For our system to be sustainable in the long run, it should continue to encourage private savings among those able and willing to work so that public resources can be targeted to those in need. The Government should play a crucial role in making each of the pillars work better. For the social security pillar, our poverty statistics tell us that despite 73% of the elderly are receiving cash subsidies of one form or another, about 38,000 elderly are below the poverty line and indicate that they still have financial needs. We are running different projections to see how we may provide them with additional support. For the in-kind support pillar, we are providing better service in the form of community care vouchers and residential care vouchers, we are helping NGOs to redevelop their sites to provide more purpose-built homes and day centres, we are embarking on a $200 billion hospital expansion programme, and we are drawing up an Elderly Programme Plan. All these initiatives will require additional public resources. For the voluntary savings pillar, we see the need to encourage voluntary contributions to MPF and to identify more financial products for retirement protection that may address the dual risks of longevity and investment. These may include silver bonds of longer maturity period and annuity plans. For the MPF pillar, I would like to say a bit more. Launched in the year 2000, the MPF has several desirable features that have emerged in the international trend for pension reform. It is a defined contribution system that links post-retirement benefits with contributions at working age and only allows withdrawal of benefits upon the age of 65 or exceptional circumstances. It is a broad-based system covering almost all of our employees who are not protected by other occupation-based systems. It is a system that requires co-contributions from employers and employees underlining the principle of shared responsibility. After some 16 years of benefit accumulation, the total net asset value of the MPF System has now grown to $607 billion, including voluntary contribution which saw an increase from $4.1 billion in 2007 to $15.4 billion in 2015. Notwithstanding the above, one has to acknowledge that this mandatory savings scheme is never quite popular with employees. We concur with the prevailing view that fees should continue to be reduced and the offsetting arrangement, which results in leakage of benefits, must be addressed. In the longer run, the feasibility of raising the contribution rates and achieving full portability should be explored. I appreciate that the MPF authority, under the chairmanship of David, will continue to do its utmost to inspire greater confidence in this private pension pillar. Efforts will continue to be made to drive down fees, quicker and deeper. Hopefully, the launch of the Default Investment Strategy next year will have a benchmarking effect, bringing down the costs further. Offsetting is a difficult and thorny issue. Indeed, offsetting is quite unique to our MPF System whereby employers can use their contributions in employees’ MPF accounts to offset the expenditure on their statutory severance payment or long service payment obligations. Albeit permissible under the Hong Kong legislation, offsetting diminishes the total contributions that can be accumulated as retirement income, especially for the low-income group, and further erodes the public confidence in the ability of the MPF System to protect their retirement income. The current term of the HKSAR Government is committed to finding a policy direction and possible measures to tackle the offsetting arrangement. Our aim is to strengthen protection for our workers without causing undue financial burden on businesses, especially the small- and medium-sized firms which constitute over 90% of our business establishments. The Government is prepared to assume a more active role if our involvement, financial or otherwise, is conducive to developing a solution acceptable to employers and employees. A society will not be a just and compassionate one if it cannot take good care of its elderly citizens, who have helped contribute to the place’s prosperity. Care for the elderly is one of the policy priorities of this term of the HKSAR Government. We have made considerable progress but clearly more needs to be done. There is no easy solution. With less than eight months before our term of office comes to an end, we will spare no effort in mapping out the right path for Hong Kong. 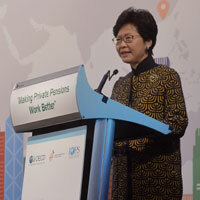 Chief Secretary Carrie Lam gave these remarks at the Organisation for Economic Co-operation & Development/International Organisation of Pension Supervisors Global Forum on Private Pensions.